you know that orange thing i started recently with the ugly decreses? well, i decided to give the original pattern a try without any so many changes this time. 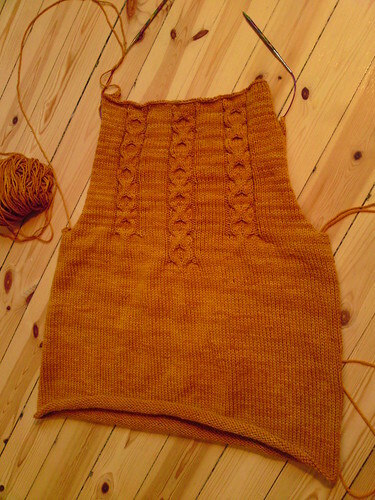 it’s a pattern from interweave knits, autumn 2007, called placed cable aran. my first attempt was with a slightly smaller gauge but larger size pattern. with added waist decreases. in the round. well, the decreases were ugly, as you could see, and i became certain that i would not have enough yarn. frogging, washing and stretching ahoy! (no, maria, i’m not making that stupid, stupid mistake again). 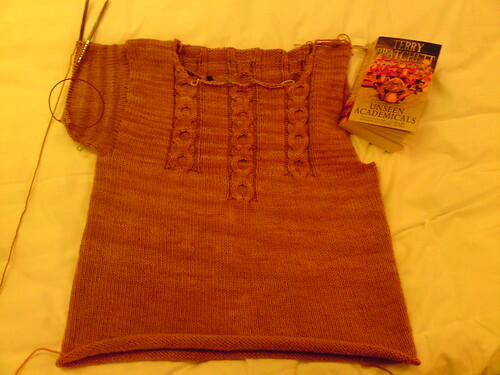 knitting and terry pratchett – perfect when travelling! 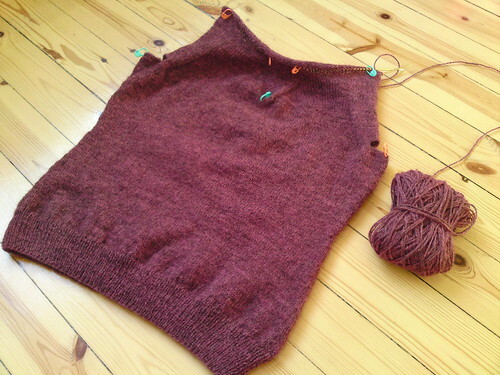 i’m still working it in the round, but i switched to larger needles (absolutely enormous, 6 mm – my hands and right arm are in pain!) and smaller size pattern. i’ve split the work for front and back at the sleeve openings, but to avoid getting a different gauge i’m using 5,5 mm needles on the purl rows, and it works! 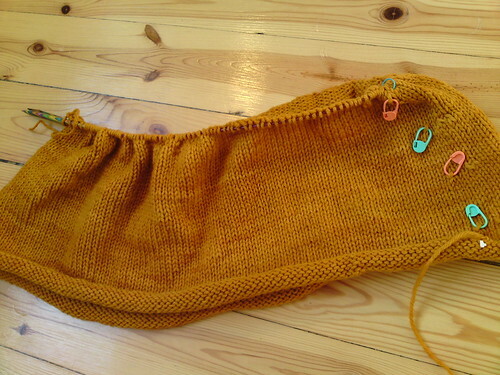 thank the gods for knit pro (knit picks) needles that allows me to have different size needles at either end of the wire. i spent a part of last weekend in växjö (i’m taking a course at the university) where i took the opportunity to visit the local yarn store, umbra, which is really nice. i did some shopping (what a surprise!) and ended up with to large balls of kauni. i haven’t been able to take any decent photos of the yarn yet, the days are really growing short and there isn’t much daylight when i get home from work. anyway, i had several hours knitting time on the train to växjö and back, and the best part of that was that i met another knitter on my way back! 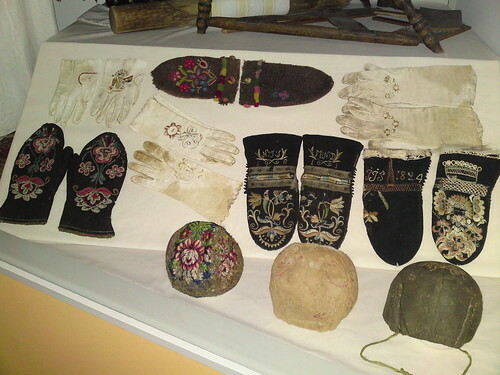 i was seated opposite a girl that hauled out a pair of mittens in the making (she also had a pair of mittens in two-end knitting (twined knitting) with her that caught my eye immediately). of course we started talking! about knitting and yarn. and ravelry, of course. 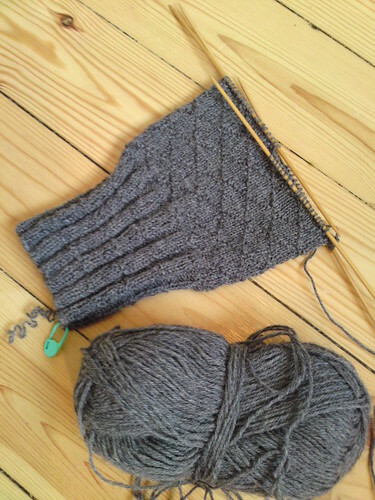 there are more of us than you know… have a look at her lovely mittens over at her blog, elaknit. anyway, i’m off to another course tomorrow, which means more travel and more knitting time! it’s a bit boring being away from home two weekends in a row, but it’s nice to have so much time to knit. and listen to audioooks! i’ve finished pillars of the earth. it was ok. i gave it four stars on goodreads, and now i wonder why i did that. i’ll have to change it to three. anyway, i’ve now begun listening to jonathan strange & mr. norrell by susanna clarke. i’ve read about one third of it before, but got stuck so i’m hoping that listening to it will change that. the narrator, simon prebble, is really good, i enjoy listening to him very much.